In March, almost 500 Dribbblers attended 15 meetups in 9 different countries. Whether it’s a handful of folks meeting up for a casual chat, or one hundred designers filling an event space to learn more about design and improve skills, Dribbble Meetups are an amazing thing. Our team is so grateful for our community and their enthusiasm to expand and bring together the local design community in their areas. 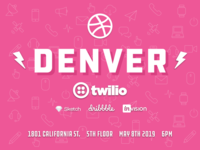 Interested in attending a Dribbble Meetup? It’s not too late to join one near you this April in places like Sarajevo, Houston, Morocco, San Francisco, and more! No meetups happening near you? We’d love to help you get started in hosting your own. “We were excited to host the Dribbble SF meetup at Hyke HQ in San Francisco! As more and more designers and creatives become freelancers, knowing how to start and run a business can be overwhelming. With that in mind, we started with “Level up your freelance finances” as our first attempt to bring real stories about freelancers who elevated their game. We wanted to share tips and examples told by financial experts to help freelancers increase their overall revenue and save big on taxes. We live-streamed the event which can be found here. “We hosted three different sessions. Two of the sessions were led by finance experts who have worked with hundreds of freelancers to help them with the finance side of their business, and the last session was an interview with a freelancer who is currently running a podcast for freelance designers and developers. Thanks everyone for a great event! Tamunotonye Richard I'm passionate about clean and modern design, smooth and simple typography, smart and visionary designs, I use visual design as a bridge to solve problems. “It was a great pleasure hosting our second Dribbble Meetup in Port Harcourt. The goal of the Port Harcourt Dribbble meetup was to bring together creatives, business owners, students and graduates to interact, learn, showcase their projects, and get help with the skills to climb the creative ladder. We began with introductions, where everybody spoke about themselves and also their expectations.We had speakers who shared their experience and knowledge across several interesting topics with room for questions after each speaker section. “We also had a marshmallow challenge after the first speaker section to show how the design thinking process and effective collaboration between team members is essential for building usable products. It was fun seeing how team members shared ideas, learned from each other, and made iterations trying to build together as a team. A demo was also presented on how to create high and low fidelity prototypes. “The event wouldn’t have been a success without our awesome sponsors who provided lots of support to make this event remarkable. Thanks to Sketch, Balsamiq, Figma, Framer, IXDA Port Harcourt, StickerMule, Rosenfeld, and Ken Saro-Wiwa Innovation Hub for their support in the Port Harcourt Creatives Community. It was a privilege hosting this meetup, we would love to do it again and we promise to make it even better this time. “Thank you for participating in our March Dribbble Meetup! Alexa gave us an excellent presentation of what it’s like to be your own boss. Her personal experience freelancing and growing her work connections for the past nine years was so inspiring it invited others to share their own experiences being self-employed. Alexa also walked us through how to set your rate, knowing your worth, having a contract (even with friends), finding clients, maintaining a cohesive brand, and things to consider when becoming an LLC. Pixetic We believe that without faith in the idea great results can't be achieved. By understanding and believing in your idea we strive to add meaning. “On March 2, 2019, our agency hosted an awesome Dribbble Meetup in Lviv. We gathered a community of over 100 UX, UI, Graphic and Product Designers to share knowledge, experiences, and some insights along with inspiration for creativity in design. Exclusively for this event, Pixetic invited renowned practitioners who spoke about their wins, pitfalls, and lessons learned while designing digital products. “It was the first time Pixetic hosted a Dribbble Meetup, yet the event turned out to be rather a small conference than an average meetup. After presentations, all of the participants had plenty of time to connect with their fellow designers, communicate with speakers, and enjoy some time with friends over drinks. Robbie Smith Illustrator and Graphic Designer with a quick wit and a steady hand. “Tampa’s first Dribbble Meetup for 2019, which was also the first in 3 years, was a networking blast. 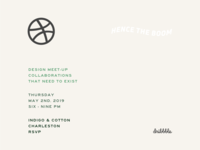 Eight people met up at the Independent Bar, a local bar that supports the art community, and had drinks and laughs as everyone got to know one another and talk design, film, and craft beer. Artistic skills were tested with an Analog Challenge to design a logo for the Tampa Dribbble community and art and stickers were swapped amongst designers who brought their own work to share. “This is the 3rd Malang Dribbble Meetup we’ve held. For this meetup, we collaborated with Lettering Malang Community and BINUS @Malang as a venue facilitator. The main topic was “A Glimpse of Lettering Process”, which was not only a sharing session but also a workshop lettering session. In the workshop, a brief was provided with instructions to hand letter the sentence “Malang Dribbble Meetup”. Of course, this accompanied by a how-to process and mentor guidance. In the end, four pieces were chosen as winners who received Dribbble Invitations! “The meetup was excellent! A lot of people were interested and 90 local designers showed up. Everyone loved it. The following Dribbble Meetups are happening soon. For the full list of upcoming meetups, visit our Meetups page.